The Boy Turns Twelve | Simple. I Just Do. Twelve?? Yes, twelve. I still can’t believe it. He keeps getting older. And bigger. And his voice keeps getting deeper. 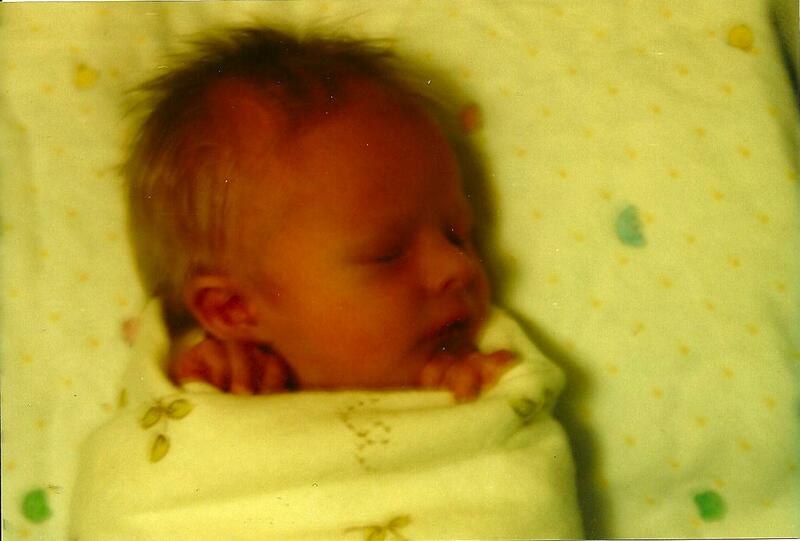 When he was born, he weighed 5 pounds, 6 ounces, and he fit between my elbow and my palm (all snuggled, of course). When he was born, the nurses quickly nicknamed him “Red” because he was born with a full, and I mean full head of hair that they thought was red. It still looks red when it gets wet, but he has always been blonde. When he was born, he was a great eater. About a month later, we almost lost him. He had a “malrotation of the intestine” which was not discovered until I questioned his pediatrician’s assessment of the fact that he was projectile vomiting across the kitchen and spitting up yellow. Only after we switched pediatricians and did an upper gi scan did they figure out he had this malrotation. And that he was hours away from being in serious, serious trouble. Immediately after the gi, they took him and told us he was scheduled for surgery in four hours. To this day, I’m glad it all happened so quickly. I didn’t have too much time to think about what could have happened. After the surgery, he wasn’t allowed to eat. They wanted everything to pass his system to make sure the surgery was a success. Therefore, only sugar water was allowed in small amounts. I didn’t realize it at the time, but pictures from that time reveal him to be this tiny skeleton-looking baby. After three days, he was supposed to be clear, but he wasn’t. He ended up not being able to eat for six days. I was still recovering from childbirth, and there was no place for either of us to sleep there – only one recliner. So we took turns sleeping at the hospital. It was the worst kind of purgatory, being separated like that, praying for his recovery, while still in pain and bleeding myself (and having to pump on top of all of it). Needless to say, he not only survived, but thrived, and soon filled out into a typically chubby, happy baby, who was still a good eater, still had a head full of blonde hair, but could no longer fit between my elbow and palm. He was growing, and he hasn’t stopped. Happy Birthday to my Boy. He’ll never know how thankful I am he’s here.